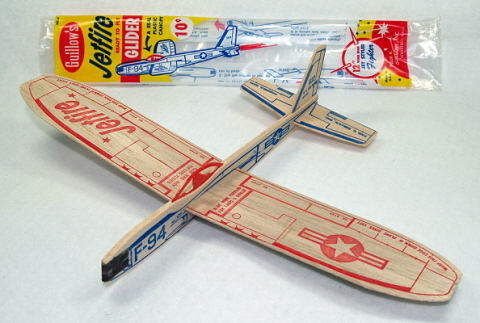 Basic gliders were 10 cents for many years. Rubber band drive propeller planes were usually 49 cents. They rarely lasted more than a day, being quite fragile. the one that you have a picture of here. I forgot which was the one without the rubber band and propeller, I remember the Skeeter, which had the rubber band an propeller, the Sleek Streak which also had wheels, and the Star Flyer which was the large version of the Sleek Streak with the large wings and the wheels. If I remember correctly, the Skeeter was 15 cents, the Sleek Streak was 25 cents and the Star Flyer was 49 cents. I'm talking back in the early to mid 60's. And you could slide the wing of the balsa gliders in their slots. If I rememember, towards the front they do loops, and if you slid it farther back, it was for straight flights. The ones with the rubber band also had a cheap set of wheels on them too. I remember buying these in the late 60s. Loved 'em! The basic ones were a nickel at that time, and you could upgrade to the rubber band/plastic propeller for a quarter. Sometimes I see them for free at trade shows and always get some. I may be getting older but I refuse to grow up. I remember buying these when I was a kid in the 50's They were a blast. Yep....wind that rubberband way tight with your finger rotating the propeller in reverse. They did break pretty easily ! I loved these! I remember the ones with the rubber band driven propeller. I got them for my kids. Such inexpensive fun! Not only was this toy so cheap everyone could afford it but......it got the kids out of the house and INTO the fresh air. OH, and Mom and Dad could ah, well, ah, they would.....ah, have an hour alone. WHOOPIE................yes, exactly!!! This was an inexpensive but fairly entertaining toy.